With so much on in the capital on New Years Eve it can be difficult deciding where to go. 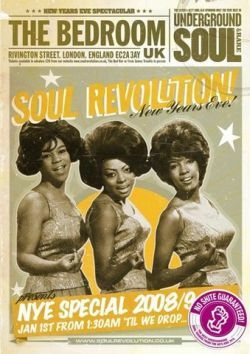 But if you have the stamina to do two venues in one night we recommend you eventually head over to the Soul Revolution New Years Eve/Day party. Operating in just the single room this time, the popular northern and rare soul night will be hosting a session on January 1st from 1.30am until the (rather ungodly) hour of 9am. Residents DJs James Trouble, Val Palmer and Mick H are joined on the decks for this special event by Plus Soul Superstar DJs Arthur Fenn, Karl Heard and Jumping Joan. Tickets are £20 in advance from the Soul Revolution website, or from James Trouble in person. Note: this night will be a ticket only event. 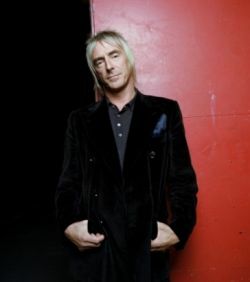 As strong as 2008 has been for Paul Weller, it has not let him stop planning more live shows in the new year. In addition to the London O2 Arena show we mentioned previously, the modfather plays the Wolverhampton Civic Hall on March 17th, Swindon Oasis Leisure Centre on the 18th, and the Plymouth Pavilions on the 19th. Tickets are on sale now (maximum of 6 tickets per household), and can be purchased from a 24-hour hotline on 0870 735 5000 or online from www.bookingsdirect.com. Normal booking fee apply. In other brief Weller news, he is on the front cover of the current Uncut issue, and latest single Sea Spray/22 Dreams is available now from all good music retailers. Stamp collecting might just become cool with the introduction of the Royal Mail’s British Design Classics postage stamps. 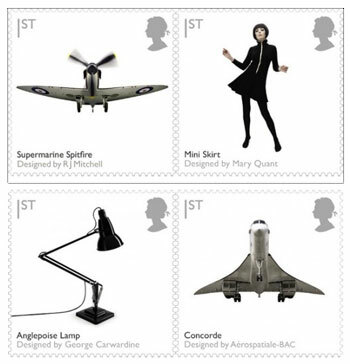 Launching on 13th January 2009, the stamps feature 10 icons of British design from the 1930s to the 1960s, including the likes of the Mini, the mini skirt, the Penguin paperback, Concorde, the red phone box and the London Underground map, all stylishly printed on a stamp with designer’s name underneath. 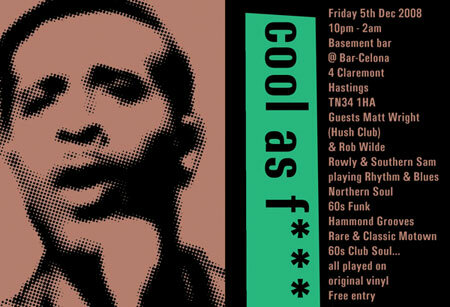 If you’re in the Hastings area, you owe it to yourself to get down to Cool As F*** on Friday 5th December 2008. Residents Rowly and Southern Sam will be joined by Matt Wright (Hush Club) for some dancefloor-friendly mod sounds, all from original vinyl naturally. Free entry at the venue, which is the Basement Bar, Bar-Celona, 4 Claremont, Hastings, TN34 1HA. Brighton’s legendary 60s girl group night Da Doo Ron Ron is back for a Christmas Special – with guest DJ Andy Lewis. Andy Lewis is always good value (I’ve booked him myself) a well as being a recording act in his own right, a recent Paul Weller collaborator and co-founder of Blow Up. He’ll be joined by Jon Slade (of Comet Gain) and the resident DJs for a night of top-notch girlie tunes. It takes place on the 12th December from 11pm. Early bird tickets are £5 until November 30th, then £6 in advance and £7 on the door on the night.